October is also known as my birthday month. But it wasn’t just my birthday. Various friends and family also had their birthdays this month and it always makes it a very gift giving and busy month. How Was October for Me? ⌘ Well this month was my birthday month. Yeay. It was also my sil and mil’s birthday and two friends had their birthday. So there was a lot of cake. Too much cake! My birthday itself was okay. I turned 30. ⌘ I need to lose weight but I seriously can’t get myself to do it. ._. ⌘ My parents were here for the week of my birthday so I didn’t have as much time to read as I’d liked. While I love seeing them, they stayed with us and it was just so busy it made me wish to spend my birthday next year alone to just read. ⌘ The week after my friend, whose birthday is on the same day as me, and I went out for cake with your little ones which was a lot of fun. ⌘ I got a ton of gifts. 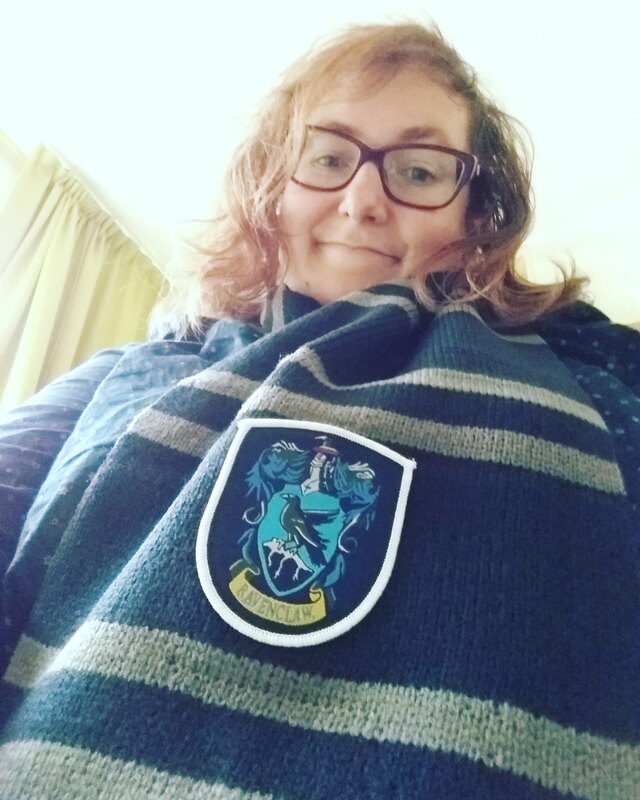 And during the last weekend of October a very good online friend surprised me by sending me a Ravenclaw scarf and I’m in love with it. I got this gorgeous Alice bookmark from La La in the Library! ⌘ This month we also decided to get our toilet redone. It was still the old style, from the previous owners. But we’ve been saving up a little and hopefully we will get it done at the end of November/start of December. We’ve been looking for tiles and everything else. Do you know how hard it is to find light/soft yellow tiles??? ⌘ I finally worked on replacing the pictures again from the photobucket fiasco. I got the book stores posts done. But I find it hard to motivate myself to go through the rest. Maybe when I have a day off again from Merijn (which is actually the day this posts). But probably I’ll just lounge, haha. ⌘ I finally ordered more pictures of Merijn. I kind of want to make a photo album on the computer of his first year with different pictures and print it than the one I am doing now. This one has a lot of questions to write down his milestones in from the first year. But just having an album of photos seems like fun to and I’d like to get that done for each year that way maybe. It is a lot of work though, even if I do it online. We’ll see. 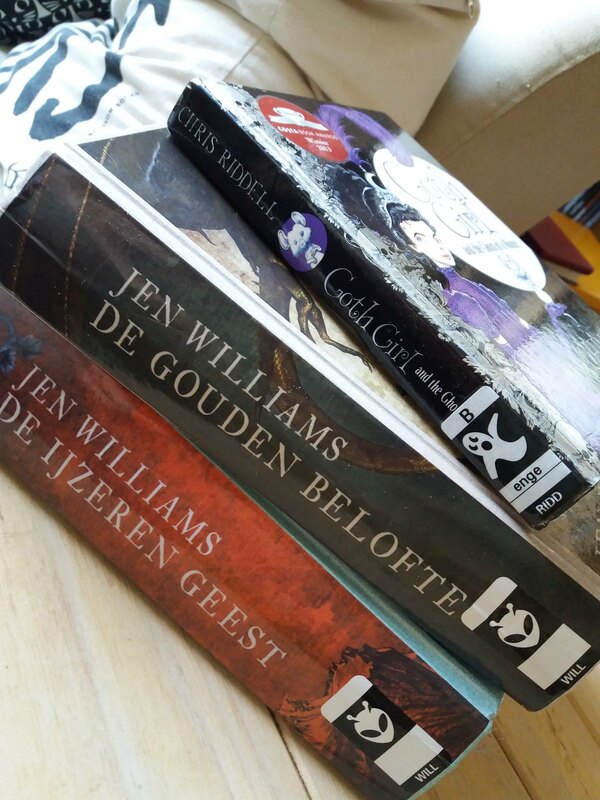 ⌘ There is a small part of me that would like to start a children’s book blog in Dutch as Merijn is growing older, but I don’t think I’m quite ready to start a second blog. It is more of a thought I’ve found creeping up in my head about things I could write about for a blog like that. ⌘ Merijn got this push tricycle from my parents as a Christmas present in advance. He is so happy with it. ⌘ I hate winter time. It is Scooby. An older one I hadn’t seen yet but great as always. I thought this was okay. They clearly changed some things from what I recal from the books but I guess that is for the best. Thomas is still a wet blanket. It took forever to finish. For some reason they started showing this after midnight in the weekend. My husband noticed it and so we watch it back on Tuesday during Merijn’s nap at the moment. I’m glad I get to watch it now as I couldn’t find the dvd box for it here. The CG is a bit weak though. I never watched the original ones but I was always intrigued by them. So when this was on the tv I had to watch it. But it was on at night and that was hard to keep my attention to. I like my early sleep, haha. So I don’t think I was as invested in this movie as I could have been. It is bad, it is cheesy, it makes me laugh so hard. I do think the first movie was better, song wise too. But the ending made me curious to see what will happen with more kids from the island coming. ⌘ Natalie guest posted on Of Wonderland and talks about Kaz Brekker and the miracle cure. ⌘ Kristen from Metaphors and Moonlight shares 10 lesser known books about vampires. ⌘ Myrthe from Boeken / Books / Bucher shared her day at Deventer Book Market 2017. 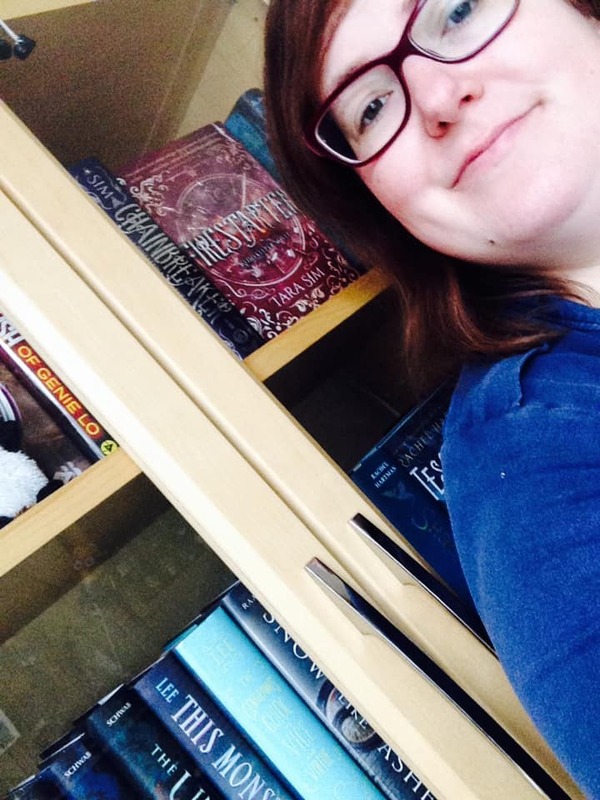 ⌘ Cait from Paper Fury did a Q&A with @DaleyDowning where they talked about their autism. AND CAIT IS PUBLISHING HER BOOK IN JUNE 2018!!!!! How cool is that? ⌘ For Top Ten Tuesday’s prompt of food in books Sarah from Books & Zombies shared a list of Discworld food. 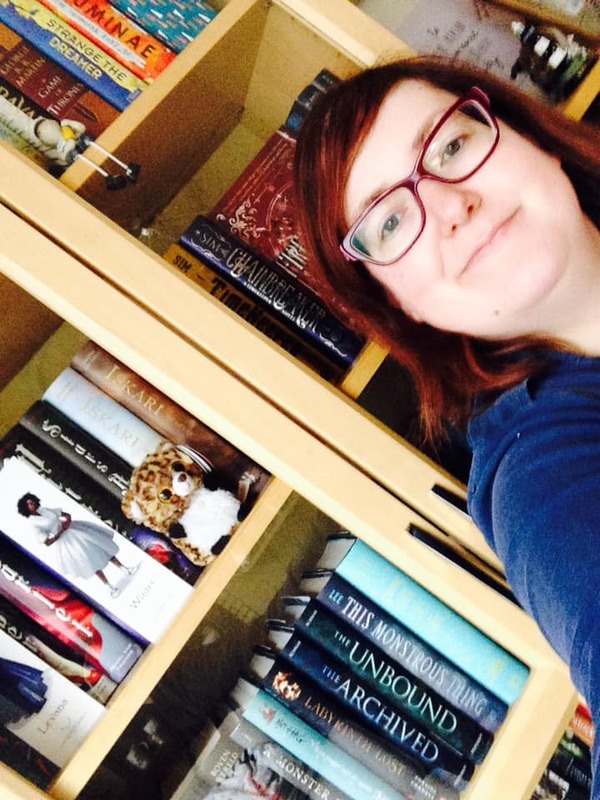 ⌘ Austine from Novel Knight talks about her collection of Caraval. 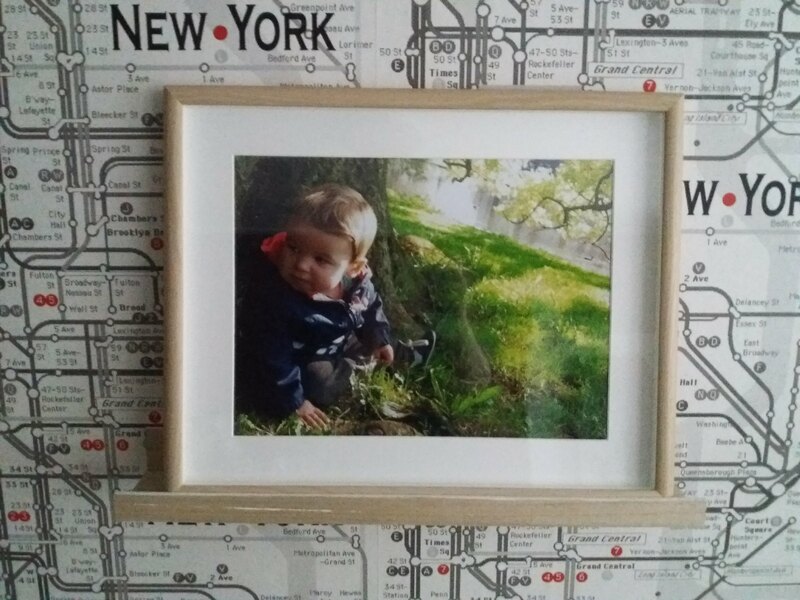 ⌘ Liesbet from Zwartraafje shared the results of her birthday survey. She also is doing a Christmas postcard exchange within the Netherlands and Belgium. You can still sign up until November 30th. Every year she shares the numbers of her book shelves. ⌘ Joanne from Craving Pages won a writing contest and is publishing her book next year! ⌘ I’m not sure what is coming up next month personally wise. We have little planned. I might go to my parents with Merijn when they are working on our toilet. Blog wise I have almost everything scheduled and written. Yeay me. I’m still working on December. ⌘ I was going to read The Mad Ship by Robin Hobb for the Robin Hobb readalong on instagram but they changed the schedule and are now starting that book in January. So I might or might not read this book in November. There is also two review e-copies and a group e-read I need to read. 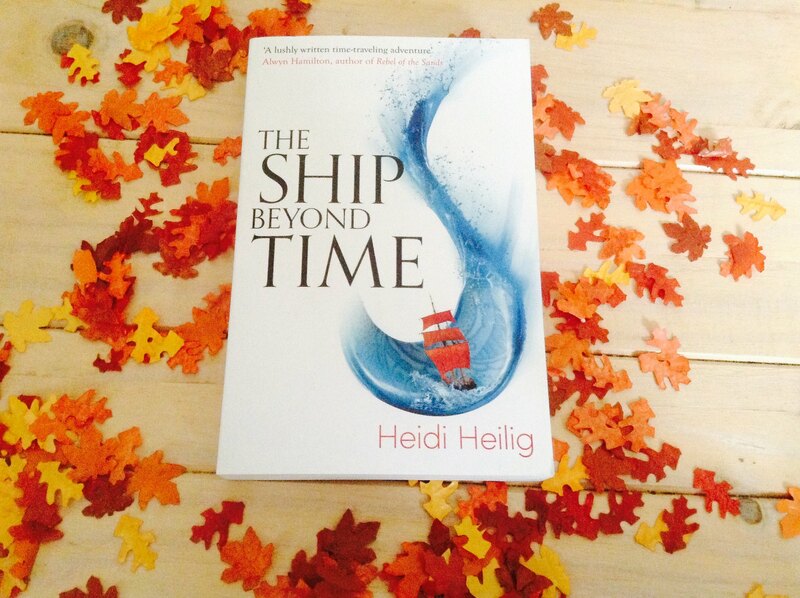 And I’ll be reading The Ship Beyond Time with Priss from The Dutch Reading Society. After enjoying the first one we are buddy reading the next one together. Other than that I’m kind of keeping my options open and I haven’t given much thought on what else to read. The Sunday post is a weekly meme hosted by Kimba @ Caffeinated Book Reviewer. This is a bit of a recap post of the week (or month) where you can link to the posts you made this week, share news and wrap up your reading. Starting now I will also link up with Monthly Wrap up from Nicole @ Feed Your Fiction Addiction. Yes. I had to pay 40+ Euro for a standard library card. Merijn’s free until he is 18 though. In Belgium I think they have to pay a lot less though. Did he get it straightened out? No I did not. we ended up going with some other type. Percentage wise of your total amount read I think that will probably still be really great though! Wow.. You have this whole month scheduled already? I really should too but I can’t seem to find the time to prepare all these posts.. I’m glad I have tomorrow planned out! LOL! Happy belated birthday. I’m loving your scarf. It sounds like you had some fun gifts. Pretty much yeah, haha. I like working ahead and not having to worry. Otherwise I have too much stress lol. I love your instagram pictures!! So pretty! I didn’t get much reading done when my parents visited, either. It’s both nice and a little stressful, haha. I think it would be really great if you put together an album. You’ll appreciate it later! It is. You want to read but then they are chatting and you feel you have to give them attention, haha. And take care of everything, haha. Woah, you didn’t like Red Rising? :0 (I mean, that much. For me it was like a million stars :D) why?? You don’t have a post yet? I will have to read it!! I’m average on Red Rising. It was okay, 3 star read. I wasn’t very into Darrow haha. I didn’t write a review on it since I don’t even have so much to say on it. Just meh. We just renovated our bathroom 2 months ago and it actually didn’t cost as much as we thought! We only replaced the sink though. Everything else like the tiles, walls & bath we just painted, it looks really good now 🙂 Good luck with yours! Thank you! I hope ours will turn out okay. Happy birthday! You can never have too much cake. I hope you have a great November! I still need to read The Ship Beyond time! gaaaah! Happy belated birthday, to you! 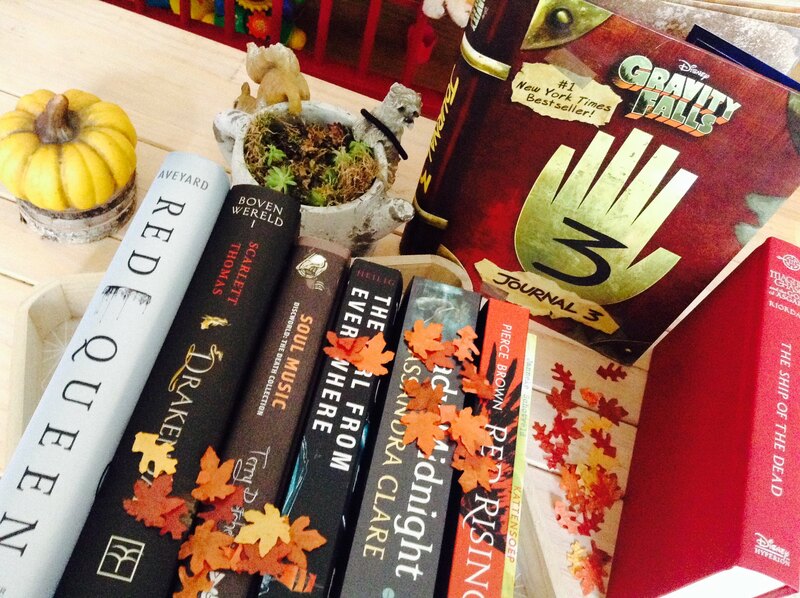 You had such a great month – I wish I was able to read eleven books per month, but I’m a slow a reader. 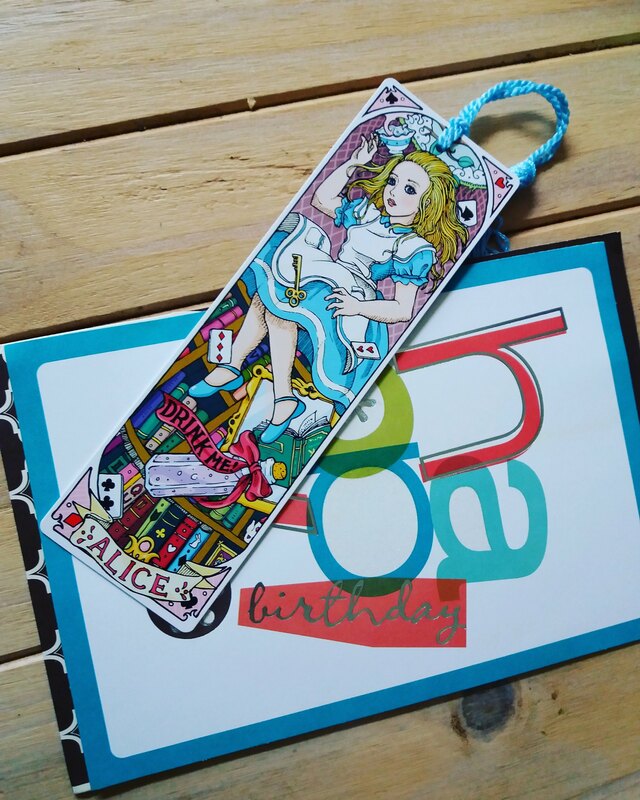 That Alice bookmark is very pretty. I love the Ravenclaw scarf! But I agree, I hate winter-time too – it’s already way too cold for me. 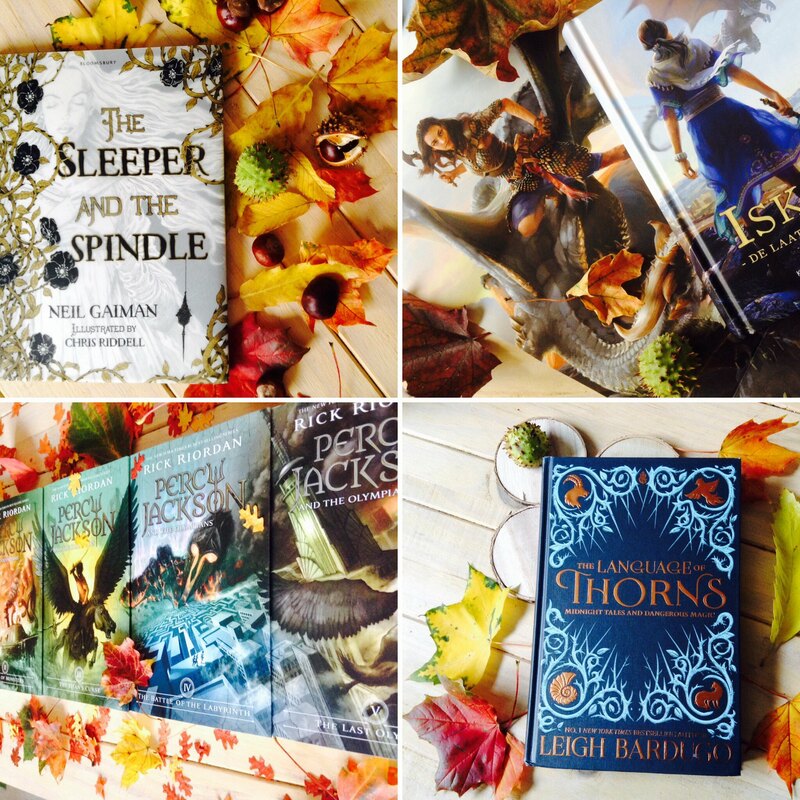 And can I just say that I am in awe how you already have blog posts ready for the whole of November?That’s amazing 🙂 Wishing you a great November! Yeah and it is just so dark. Aaaw thank you haha. I need it for my own sanity. I do a photo album every year and I love it and definitely recommend it. Although it takes a while….I’m still on 2013….whoops lol. I use SnapFish and love how it turns out since I can move pictures around and chose my backgrounds. Good luck!! I am trying my best on the catching up bit. It is so draining for an introvert too. I’m glad I’m not the only one who is ‘behind’ haha. The Name of the Wind was great, but I do regret reading it a little, because we still have no idea when the next book will be coming out. I’ve been putting the Wise Man’s Fear aside for ages because it allows me to feel like I’m not ready for the next book yet. So I would suggest to wait. Haha. I think that is also one of the reasons why I have been putting it off. Just not knowing. In that I regret reading ASOIAF two years ago since how am I suppose to remember everything when the next one comes out? Losing interest over here. You seem to be doing much better on your challenges then I am. Good for you, that’s awesome! Happy Belated Birthday! October seems like the best month for a birthday. Mine is in May so no one dressed as a superhero at my parties when I was growing up. Your gifts look awesome too. That Ravenclaw scarf is great, especially since it is starting to get chilly outside. I actually love the snow, but I am from Florida so it is all new to me now that I live somewhere that it actually snows. Sorry that October ended up being more busy than fun. Hope November is better!! Ik moest ook even lachen toen ik dat stukje over het bloggen over kinderboeken las. Ongeveer een week geleden heb ik een nieuwe rubriek uitgewerkt waarvan binnenkort (23/11) de eerste post verschijnt. Wie er geen interesse heeft kan het uiteraard overslaan maar vermits het mij als boekliefhebber en meter/tante wel aanspreekt vond ik dat het een plaatsje op mijn blog verdiende. Ik denk dat ik het maximum 1x per maand én misschien zelfs iets sporadischer zal doen maar de eerste twee staan alvast klaar. Hopelijk kan ik binnenkort mijn Hufflepuff-sjaal afwerken. Die gaat heel leuk staan bij de Hogwarts-tas die ik cadeau kreeg van mijn nicht. Nu het weer helemaal omslaagt gaat hij ook gewoon noodzakelijk worden om het toch een beetje warm te hebben. Ja en met sinterklaas en kerst opkomst vind ik het ook lastig om die lekkere dingen te laten staan. Ik bedoel warme chocolademelk met slagroom? Nouja, dan probeer ik het weer in Januari. Oh wat leuk! Ja met kinderboeken kan je ook best veel. Ik ben benieuwd. Ja dat word een super combo! Seriously, such a big boy. Haha I’ve gotten that response often for that one. Happy belated birthday! Wow you are very busy and very organized too. I am impressed with the number of posts and books. 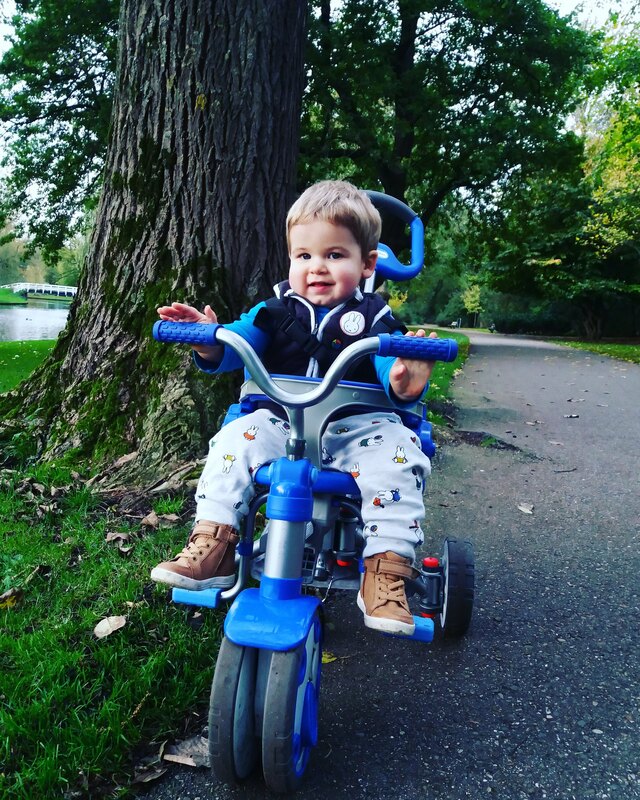 The picture of your son on his new trike is adorable.